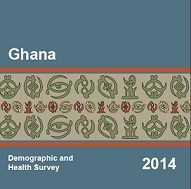 This report presents findings from the 2014 Ghana Demographic and Health Survey (GDHS), a nationally representative survey of 9,396 women age 15-49 and 4,388 men age 15-59 from 11,835interviewed households. The primary purpose of the GDHS was to generate recent and reliable information on fertility, family planning, infant and child mortality, maternal and child health, andnutrition. In addition, the survey collected information on malaria treatment, prevention, and prevalence among children age 6-59 months; blood pressure among adults; anaemia among women and children; and HIV prevalence among adults. This information is essential for making informed policy decisions and forplanning, monitoring, and evaluating programmes related to health in general, and reproductive health in particular, at both the national and regional levels.